Greening has over one half a century of experience in designing and building high-quality test equipment and providing testing services to the automotive and related industries. Greening Associates Inc. was founded in 1962 and, that very year, retired General Motors brake engineer T. P. Chase authorized Greening to manufacture his test machine. The first Greening Chase Machine for the assessment of dry friction materials was manufactured in 1964. The following year, Greening Associates was officially incorporated, and in 1966 the company acquired its first manufacturing space. 1967 would prove to be a pivotal year for Greening, as GM and the Society of Automotive Engineers (SAE) Wet Friction Materials Subcommittee granted the use and ownership of the casting patterns for GM’s second wet friction materials test head for what was the forerunner of the SAE No. 2 Machine. Since then, Greening has produced the SAE No. 2 Machine in keeping with the spirit of the original agreement. Also that year, friction material testing services on our Chase Machine were offered to various industrial firms, leading to the doubling of manufacturing space in 1968. 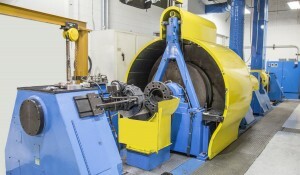 In 1969, Greening built our first double-end inertia brake dynamometer for the National Bureau of Standards (NBS) and were certified by the New York State Department of Motor Vehicles to perform Chase tests. Greening kicked off the 1970s by moving into the current Detroit facility, increasing our operating space by 40 percent, and in 1971 Greening Testing Laboratories Inc. was born. The following year we undertook our most ambitious manufacturing project to date, constructing a 155,000 lbfts² slug-ft² single-end inertia brake dynamometer, with inertia discs 14 feet in diameter, for testing off-road open-pit mining vehicle brake assemblies. The machine was so large it had to be built on site at the Rockwell Standard (now Meritor) facility. In 1975, Greening introduced the first independent inertia dynamometer testing service available to the industry. We followed that up one year later by building a 92-foot-long dual-end Railroad/Rapid Transit Inertia Dynamometer for the Abex Corporation. The machine featured automatic selection of the inertia discs. Greening’s overseas presence began in late 1960’s with placement of test machines in Europe and South America. 1988 saw a major expansion of our international operations in Asia with the installation of an inertia brake dynamometer in China, which would be followed by others in South Korea. In 1995 Greening partnered with Dr. Thomas A. Flaim to develop a certification test service based on his Dual Dynamometer Differential Effectiveness Analysis (D³EA®), a computer analysis of dual-end dynamometer test data derived from the simultaneous testing of a vehicle’s front and rear brake assemblies. This test is predictive of whole vehicle stopping distance and provides a basis for vehicle braking performance consistent with Federal Motor Vehicle Safety Standards (FMVSS). The 21st century has seen us further expand our manufacturing and testing space. In 2001 we increased our manufacturing area by 60 percent with a building expansion and in 2006 we acquired additional space, enlarging our campus to ensure that we can continue to provide high-quality services and equipment for years to come.